As your consignments travel to their destination they will be checked by a number of different organisations including port authorities and transshipment agents. The packing note ensure that your goods can move without undue delay. Some goods are controlled and will require a license to enter and/or leave certain countries. Carefully check with your agent or the BERR (Department for Business Enterprise & Regulatory Reform (formerly the DTI) as they can give you advice on any licenses you may need. To ensure your goods move to their destination quickly, always ensure you have the correct tax and duty paid in full. Goods that move in and out of the EU are taxable. Border control and customs officials will want to see documentary evidence that you have completed all the tax and duty paperwork correctly. If you intend to use an export agent or a freight forwarder, the ECSI is the form you use to give them instructions about your consignment. 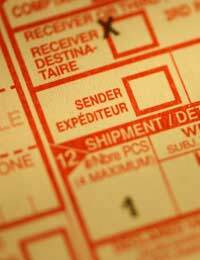 This form should include details about the destination of your goods, any special arrangements that are needed (refrigeration for instance) and the route to their destination. This document is used to give documentary evidence that you have a legal contract with the carrier of your goods. The B/L is usually used when consignments are moved by sea. This document shows that your goods have moved into the legal responsibility of the carrier while they are at sea. The B/L is usually completed by your freight forwarder or agent. Both these documents enables your goods to be quickly collected at their port of destination by the importer. They will need to prove their identity, but this form can save you time when moving large numbers of consignments overseas. The shipping note is the standard form that gives details of the consignment that it is attached to. Note that if your businesses is exporting hazardous goods, then the SSN must be replaced with the DGN (Dangerous Goods Note). You can see detailed instructions about how to complete the SSN on the SITPRO website: www.sitpro.org.uk/trade/standard.html. If you are moving goods within the EU, all of your consignments must be accompanied by the SAD form that is also known as form C88. This form can be submitted manually, but its more common to use the CHIEF (Customs Handling of Imports and Exports Freight) electronic system. The SAD form must contain your goods' Commodity Code and the Customs Procedure Code. This is an electronic system that Customs & Excise use to track exports. The system generates export declarations that are attached to your consignments as they move from despatch to their final destination. Details on how the system works can be found in HMRC (HM Revenue & Customs) Notice 276. Businesses that move foodstuffs must provide a certificate of origin. If your goods are also of animal origin you will also need a valid veterinary certificate stamped by the Border Inspection Post before your goods will be allowed entry into any EU member state. If you will be moving livestock for instance, your consignments must have Part 1 of the CVED (Common Veterinary Entry Document) that indicates that your consignment has passed all heath checks. All documents must be legible. There is no international agreement that documents must be typed, but this is generally accepted as preferable. Handwritten forms can often become illegible. Correction fluid must not be used in any circumstances. This could trigger an investigation into why the document(s) were amended that could delay the processing of your consignment(s). Any alternations must be crossed through but not completely deleted. The changes should be stamped and signed by the person completing the documentation. Faxes or photocopies may not be acceptable in some countries. Check with your agent before completing your documentation and dispatching your consignments.